Ciao a tutti! I'm finally back from my Italy trip! Although I was extremely sad to leave, I was itching to get back to my laptop to edit the footage that I shot in Rome, Florence, and Venice with my Osmo Mobile 2. After spending three days in Rome, I felt like I had barely scratched its surface when I left. Although filled with many tourist traps and large crowds, there are also quieter neighborhoods scattered across the city that will give you a taste of the local lifestyle. If you're planning to visit Rome soon, my tip to you is to get to try to get lost in the narrow alleyways in local neighborhoods like Monti or Trastevere. Filled with excellent cafés, bars, and restaurants, I find these colorful neighborhoods to be far more intriguing than the always-crowded Vatican city or Spanish Steps. You'll spend less time waiting in line and more time immersing yourself within a more authentic side of the city. We stayed in the beautiful Monti neighborhood, an area filled with colorful houses and greenery. There are small cafés, bars, restaurants, and boutiques every corner you turn. It's filled with locals, but also conveniently located next to the Colosseum and Roman forum—so you have touristy activities at your disposal. It's also only a 15 minute walk away from Rome's main train station and metro stop, Termini station. Try to go to the Colosseum when it first opens in the morning (around 8:30AM) to avoid the crowds and the heat. Make sure to buy your tickets ahead of time (we received them through the Roma Pass) to skip the lines. After finish up at the Colosseum, head over to explore the ruins of the Roman Forum, which is only a couple of minutes away. Important: You must eat at Osteria da Fortunata. The pasta is handmade by an Italian grandma sitting in the window and they have an oxtail fettuccini that's to die for. Make sure to make a reservation beforehand though, considering they are popular with both locals and tourists. Also, make sure to brush up on your knowledge of Italian pasta dishes since there is no English menu. Dare to climb the 551 steps in the dome of St Peter's Basilica to catch this sick view? Stop by at Sant’Eustachio Il Caffè, an ancient coffee shop born in the thirties, to grab a 10/10 cup of coffee. My favorite coffee drink in Italy was the Shakerato, which is prepared by shaking expresso with ice cubes in a cocktail mixer. It's not very easily obtainable in the U.S., but it's everywhere in Italy. It's in my opinion a perfect treat for those Italian hot summers. After visiting Sant'Eustachio's, walk only a few steps to get to the Pantheon. It's crazy to think that this architectural feat was completed nearly 2000 years ago. Although once a Roman temple, the Pantheon now serves as a church. Italy or Eataly? Stop for some street food and eat whatever looks good to you in the window. Italians absolutely love putting their food on display. Just try to get a bit further away from major tourist locations to ensure that you aren't paying steep prices for dishes that have been modified for tourists. 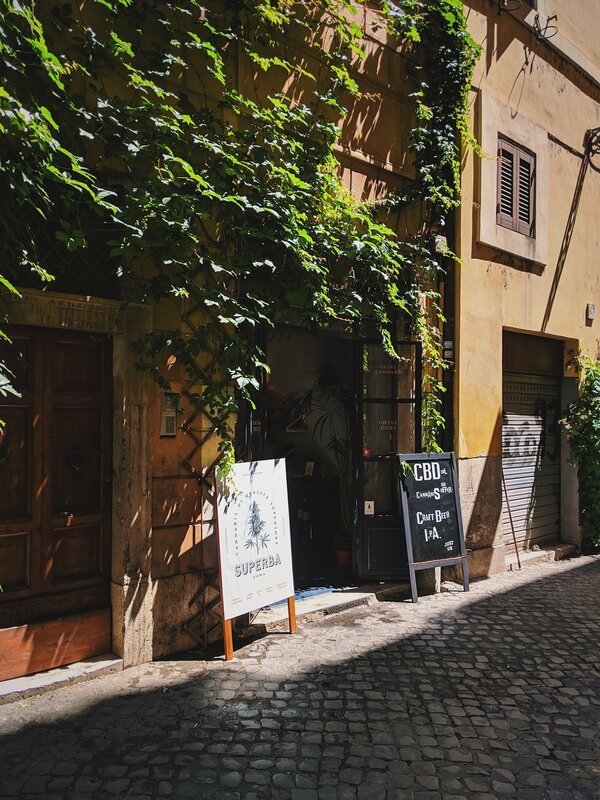 Escape to Trastevere, Rome's more traditional neighborhood that has the look and feel of a small town. You'll find people chatting away in its many cafés and having dinner on terraces overlooking the sunset. Try to visit this neighborhood during the evening, as many street performers will flock in the area around Piazza di Santa Maria. Don't forget to go for a gelato at the famous Gelateira alla Scala while you're there! I got the caramel cookie and black cherry. Take advantage of Rome's many free sights, including the picturesque Piazza del Campidoglio and the lively Piazza Navona (which fills up with artists and street performers in the evening). I wish it wasn't so, but the Scalinata di Trinità dei Monti (Spanish Steps) seems to always be filled with hoards of tourists. Try to climb to the top to the Trinità dei Monti, a church where you'll catch a gorgeous view of Rome's rooftops. There is also a street in front of the steps filled with designer clothing stores, in case you need to do any impulse shopping. Stop by Campo Di Fiori early in the day to stroll through the farmer's market and to...yes, eat more food again. Note that pizza is sold by weight, so don't be afraid to grab a few small pieces of each different kind (many of which are topped with fresh ingredients and vegetables, which you'll rarely find in American chains). The last photo is of pistachio-crusted lamb from Roscioli, a deli + bakery + restaurant serving a wide range of Italian staples. Don't forget to stop by the Trevi fountain to make a wish! This has been quite a long post to finish. From sifting through countless photos to finding the right clips to edit into the vlog, I'm quite exhausted from the amount content I've gathered while I was abroad. And... I'm not even close to being done. We've still got Florence and Venice to go—so watch out for those posts and videos as well! Rome has been hectic but also beautiful and intriguing. Out of all the Italian cities I've visited, Rome stands at number 1 for its food. Definitely come with an empty stomach.